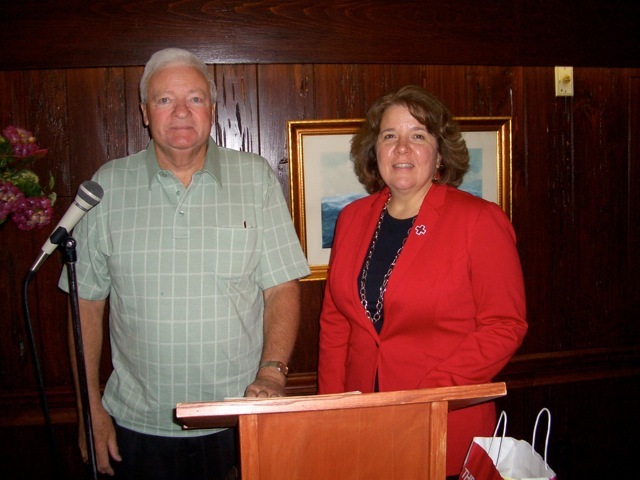 Pictured are Jack Jermyn (President of the Niagara Mohawk Retirees Association) and Karen Ferguson (Director of the Oswego Chapter of the American Red Cross). The Niagara Mohawk Retirees Association held their monthly luncheon on Wednesday at Vona’s Restaurant. The guest speaker was Karen Ferguson, Director of the Oswego Chapter of the American Red Cross. The mission of the Red Cross was covered as well as the services provided by the Red Cross. The Red Cross provides disaster relief, training, blood services, and assisting with contacting members of our Military assigned over seas. The Retirees Association would like to thank Karen for a very informative presentation. The Retirees Association holds monthly meetings from May to December. Anyone who worked for Niagara Mohawk Power Corporation in Oswego County during their careers is eligible to join. If anyone has questions or would like to join, information can be obtained by contacting Tom Restuccio at 343-2601.